Several people have been arrested in police operations directed against dissident republicans in Belfast and Newry during the past two days. Details of the arrests were only revealed during a meeting of the Policing Board. Chief Constable Sir Hugh Orde told the meeting the threat from dissidents was considered to be very high. He urged the public to be vigilant while giving a detailed assessment of the current threat. 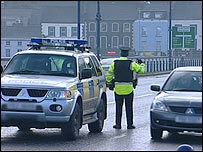 Checkpoints are again in place in some areas because of police fears that a major attack is being planned by dissidents. Security has been increased to the highest level for many years. Thursday's meeting was the first public session of the board since the Omagh bomb trial ended in December during which aspects of the police investigation were strongly criticised. The board is expected to announce whether it will press ahead with plans for a review of the investigation. The review is opposed by many of the relatives of the 29 people who died in the bombing. They want a cross-border public inquiry.